As a society, we seem to be schizophrenic – or at least inconsistent – about our attitudes around touching each other these days. Teachers are not permitted to hug students – even a comforting hug for a crying kindergartener can be misconstrued, turned into something suspect. Elementary school kids are not allowed to touch each other at all. No poking, tickling, shoving, hitting, patting – nothing. That’s actually a good thing, I think, on the whole. In the workplace, any physical contact is either unprofessional or risks a sexual harassment charge. You make friends with the people with whom you work (if you’re lucky), so I don’t agree with that hardline stance. But then, there’s the other side. Take pregnant women, for example. The fact that you have a baby in your belly seems to say to everyone that your stomach is now public property. I was always amazed at how total strangers would pat my belly when I was pregnant. It’s the same amount of me, the same belly (well, less of it), that I have now. Can you imagine coming up and patting my belly NOW? Now that it’s just a normal, run-of-the-mill, doing-nothing-but-digesting belly? Hell, no! If you tried it, you’d find yourself short a hand. The same public property principle seems to apply with Kelsea’s hair. 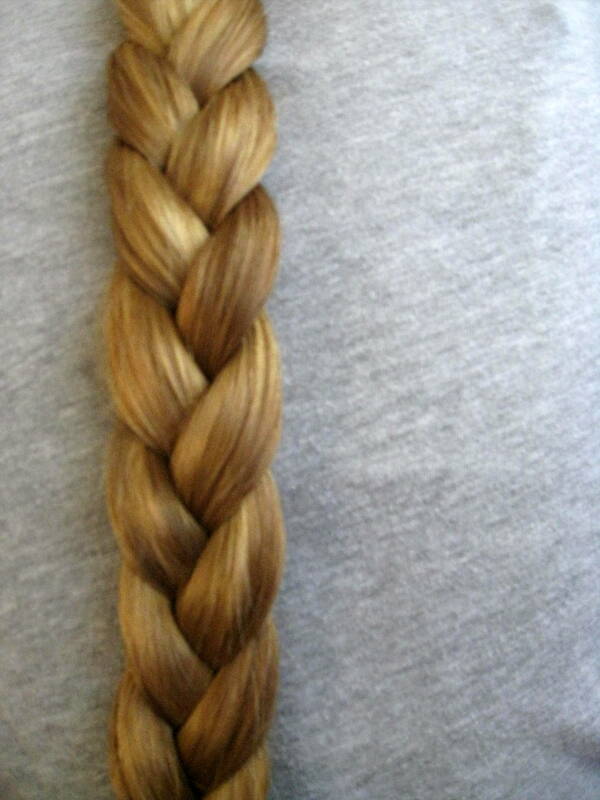 It’s at least two feet long when it’s in its daily braid, and that braid seems to have an irresistable appeal to her fellow students. Everyone touches it, plays with it, pulls it, flaps it. It makes her INSANE. She absolutely hates it. She’s told them in no uncertain terms to STOP. And she’s entirely within her rights. It’s part of her body. Again, if it were another part of her body that was different from everyone else’s – say a deformed arm – it would be completely unacceptable for everyone to be touching and poking it. But because it’s pretty and because it’s hair, it’s fair game. That’s wrong. The day after school ends, she’s donating 10-inches to Locks of Love – that way, her hair will be easier to care for over the summer, she’ll be doing something to help others, and it will grow back enough by the time that school starts that everyone won’t make a fuss about her cutting her hair. If the hair-harassment (hairassment?) continues next year though, I may say something to the school-folk about it. (After she punches someone in the face.) It’s the principle of the thing. And what’s more, the school seems to turn a blind eye to middle-school bullying, which includes punching, throwing things, and shoving. I can only imagine the challenge of trying to administer appropriate protocols in a large middle-school, but the offenses which are noted and punished seem to be minor – and seem to be identified haphazardly. Again, where’s the consistency? Is there a solution to this quandary? I’m not sure. Maybe we all just need to relax? Or maybe we’re all too far down some self-destructive pattern of evolution for us not to be paranoid about appropriate touching being misconstrued? Unfortunately, I don’t have the answers. I’m just here to ask the questions.